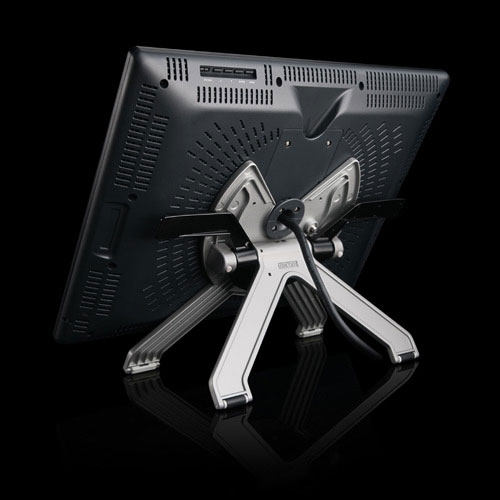 Cintiq 21UX - ACE Peripherals ::: Completing I.T. Wacom's pen input technology allows for freedom of expression, inspired creativity, and significant improvements in productivity, control and comfort. 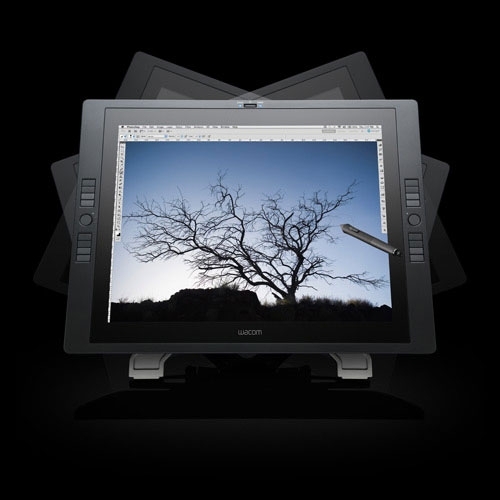 Since its introduction, the Cintiq 21UX has represented the premier direct on screen experience for professional artists, designers and animators. Now this flagship product is even better. The new and improved Cintiq 21UX now features Intuos4 technology and enhanced design. The pen has been upgraded to include the new tip sensor, which delivers precise pressure control starting with as little as one gram of pressure. Combined with 2,048 levels of pressure sensitivity and 60 degrees of tilt recognition, the Cintiq 21UX offers better feel and performance than ever. For many professionals, working directly on screen is the most natural way to create digital art. This is especially true for those originally from traditional art backgrounds who are used to drawing and painting on canvas. With a huge 21.3" TFT screen, the Cintiq 21UX provides plenty of space to create. The LCD panel features a wide viewing angle for superior visibility and contains special anti-glare coating to allow operation in bright environments. 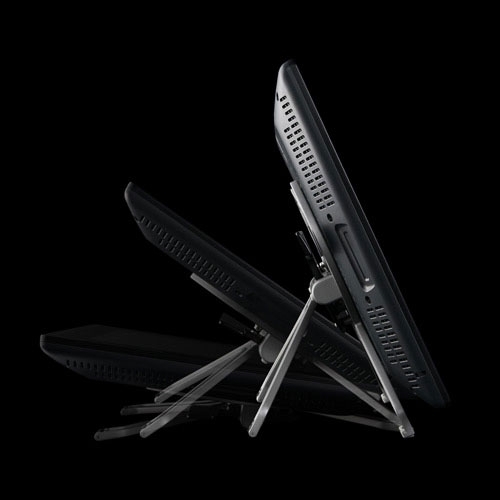 A dynamically-adjustable stand allows the display to be rotated up to 180° in each direction, incline the display from 10° to 65°, and even remove it for comfortable laptop use. 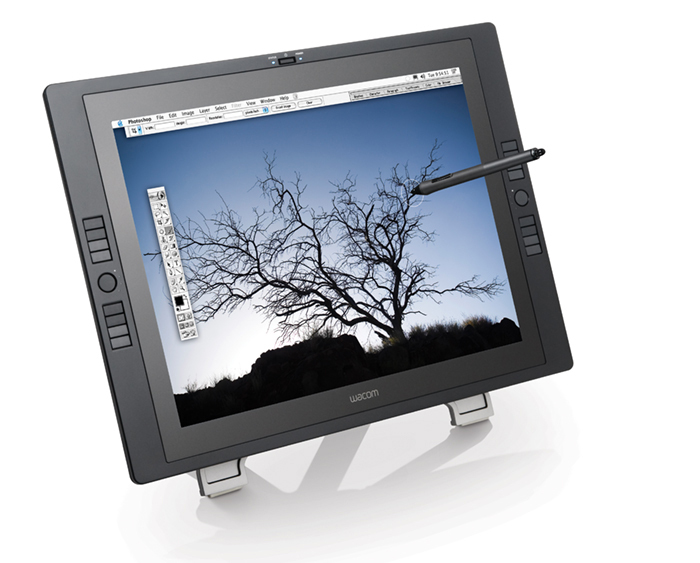 The Cintiq 21UX has been designed to provide the most natural feel possible. The direct on screen experience has been enhanced with the introduction of the new pen tip sensor. This new technology allows for operation with a feather touch - as light as one gram of starting pressure. Three different types of nibs are included, all with unique feel. And, a variety of accessory pens are available with different feel and effects. The Cintiq 21UX provides the best-of-class pen experience for working directly on the screen. Thousands of professional artists, designers and animators depend on the Cintiq to optimize their workflow and to produce their films, special effects, CG art, industrial designs and more. From Hollywood to Bollywood to the design rooms of most of the world's auto makers, the Cintiq 21UX is the professional's tool of choice. The Cintiq 21UX now features the same cutting-edge technology as the Intuos4, with the added benefit of being able to work directly on screen. The new pen tip sensor activates with a starting touch as light as one gram, and Wacom guarantees the pen to perform for more than 20 million cycles, or several years of normal use. With 2,048 levels of pressure sensitivity and up to 60 degrees of tilt sensitivity, the Cintiq 21UX truly offers the best performance available. The Cintiq 21UX has undergone a facelift to be more attractive, and more importantly, more comfortable. The ExpressKeys are now aligned vertically as they are with the Intuos4. This allows for more natural finger movements to access the keys, and easy chording. With the ExpressKeys on both sides of the panel, they are ideally positioned for ambidextrous use. The Touch Strips remain in the back of the panel for the most intuitive control of zooming and scrolling. Keystroke...: Enables your to set keyboard shortcuts. Modifier...: Enables you to simulate SHIFT, ALT, CTRL for Windows, and SHIFT, OPTION, COMMAND, CONTROL on a Mac. Radial Menu: Displays a Radial Menu on your screen. Each level of the hierarchical menu consists of eight menu slices which may contain various features and options to choose from or customize. Up to three levels for a total of 512 possible settings. Back: enables you to move back one page in browsers and other applications. Forward: enables you to move forward in browsers and other applications. Pan/Scroll: Enables you to position a document or image in any direction within the active pane by pressing a tablet or pen button set for PAN/SCROLL and then dragging with the pen tip across the tablet’s active area. Show Desktop: Minimizes all open windows to display a clean desktop. Switch Application: Brings up the application switching dialog with focus on the next open application. On Windows Vista systems running Aero, Flip 3D will be activated with focus on the next open applications. Open/Run...: Opens a dialog box where you can select a specific application, file, or script to launch. Precision Mode...: Changes the mapping around the current pen tip position such that you must move the pen twice as far for the screen cursor to cover the same distance on the display screen. To activate, press and hold the tool button to which this function is assigned. Releasing the button returns to normal mapping. Show Settings: Displays a diagram of the tablet ExpressKeys and Touch Ring, showing the current function settings for each control. Application Defined: Reports only the button number to the application. This is for applications, such as CAD programs, that have built-in support for the Intuos4 Mouse or Lens Cursor. This function may also be used by some highly integrated applications for direct control of the pen tablet ExpressKeys and Touch Ring. Default: Returns the ExpressKey to its default setting. Mode Toggle...: Toggles between pen mode and mouse mode. Display Toggle: (For multiple monitor systems.) Enables you to toggle the current tablet mapping and screen cursor between different displays when you press an ExpressKey that has been assigned this function. Tablet PC Input Panel: Opens the Tablet PC Input Panel when you press a tool button set to this function. Tablet PC Defined: Sets the button function according to the setting found in the Windows Vista "Tablet PC Settings" and "Pen and Input Devices" control panels. Ink Toggle: Toggles the “write anywhere” function of Inkwell on and off. Inkwell automatically recognizes and converts your handwriting into text and inserts it into a document. Ink must be turned on for this function to work. See your Macintosh help for information on working with Inkwell. Expose: Tiles all open windows.